We are excited to announce that the ResearchTies Helpdesk was released this week! If you have ever wondered what data goes in which field or struggled with learning the different features of ResearchTies, help has arrived! To open the new helpdesk, click on the blue help tab on the right of the screen after signing in to your account. It is located just above the feedback tab. To open or close the helpdesk, click on the blue help tab. The panel can be left open, and the content will change as the user moves through the program. If help is not needed, close the panel by clicking again on the blue help tab. The main section of the help material will provide instructions for the program screen that is open. At the bottom are links to descriptions of the toolbar functions. Hyperlinks within an article will open additional instructions. These are particularly helpful when clicking an +Add button. When opening an add template, click the hyperlinked article to view the instructions related to that template. To move forward and back between previously-viewed instruction screens, click the left and right arrows in the upper left corner of the helpdesk. While the help articles are being written, some panels will indicate that they are Under Construction. We appreciate your patience as we complete the content of this new feature. As always, feedback is appreciated to help us improve the program or any of its features. 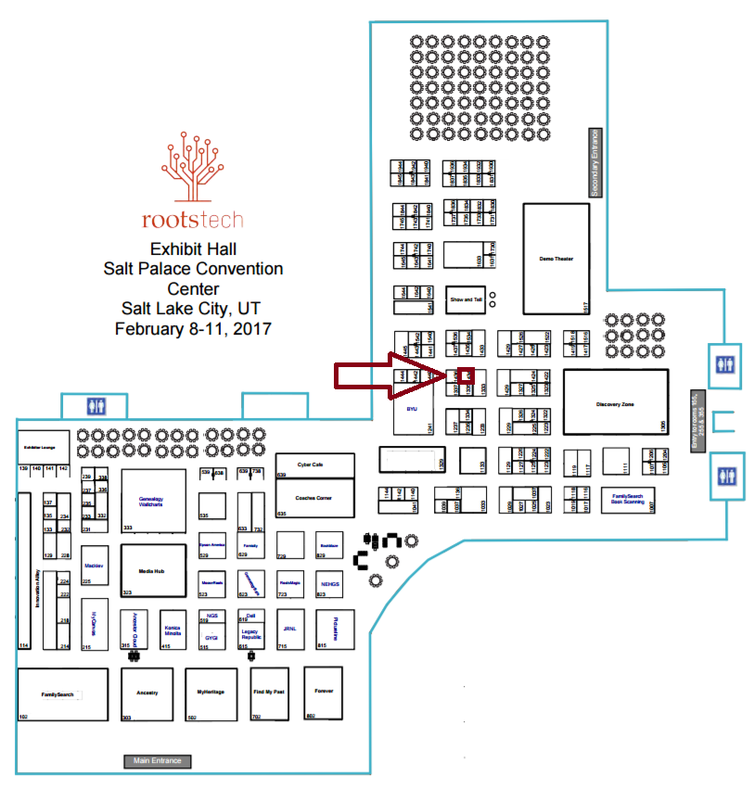 Are you coming to Salt Lake City this week for the annual RootsTech conference? Don’t miss all the fun and excitement! For ResearchTies, RootsTech will start the first hour of the conference with our class, “Share the Work: ResearchTies and Multi-User Logs.” Come to room 255D at 3:00 on Wednesday to learn how ResearchTies can help you work together with other family members. Create multi-user logs to coordinate research with siblings, cousins, or even a full society or family organization. From Thursday through Saturday, come visit the Expo Hall and learn more about ResearchTies in booth #1434. We will be just around the corner from the large BYU booth. Come learn more about the new Helpdesk released this week. Hope to see you there! Do you coordinate your research with family members, other professionals, or work on a group project at your genealogical society? STEP 1: A ResearchTies subscriber creates a new log. a. 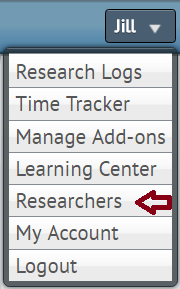 The following menu is shown upon logging into the ResearchTies account, or by clicking on the name of the currently open log in the upper right corner of the screen. c. Name the log and save it. You can also share a log that was previously created. STEP 2: Send email invitations to other subscribers. b. Click the “+Add” button in the upper right corner of the list of researchers. c. Enter the email address associated with the ResearchTies account of the user with whom you want to share a log. d. Enter the user’s name, then select which log(s) you would like to share. e. Click “Add Researcher.” The automated email will be generated. STEP 3: Those receiving the invitations need to click on the link in the email to accept the invitation. STEP 4: The shared log is added to the researcher’s list of logs after accepting the invitation. STEP 5: Each researcher works in their own account on the shared log. STEP 6: The program tracks who is making various changes to the log. STEP 7: All researchers can search the log to see what has been done. This includes searching for data and documents, as well as searching by researcher to see what has been added or edited by others. The search templates for finding objectives, searches, and results now include a field for “Researcher.” Select from the dropdown the researcher whose work you would like to see, or leave it blank to see the work of all researchers. 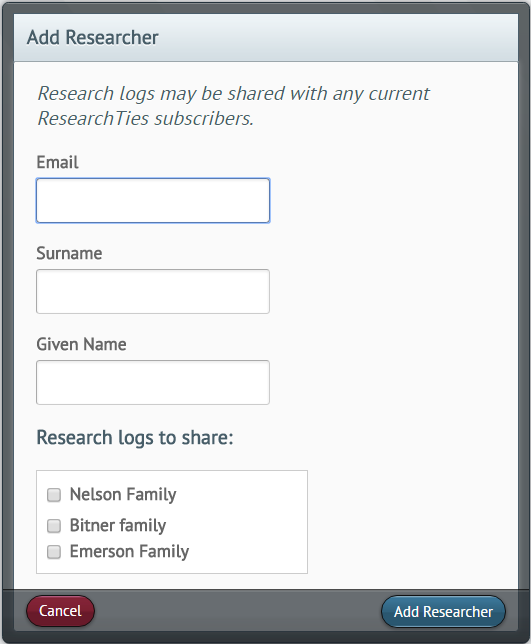 Each personal account in ResearchTies allows the subscriber to create three logs. However, each subscriber may receive invitations for an unlimited number of logs. Professionals or other researchers who need more than three logs can subscribe to add-ons in bundles of ten. Non-profit genealogical societies that are interested in using ResearchTies for a society project, send an email to: support@researchties.com to request additional information. Societies may use the program at no cost for non-profit projects if at least five members of the society have subscriptions with ResearchTies. Now there are two ways to share your research using ResearchTies. Use the multi-user function for multiple subscribers to work on the same log, or generate PDF reports that can be emailed to non-subscribers to share your searches and documents. Start sharing today! ResearchTies has the ability to share sources with FamilySearch. This program uses the FamilySearch ID field in ResearchTies to identify the correct person on Family Tree. Locating an exact ID match ensures that the source is linked to the correct person. Because of this functionality, the source can only be shared if the ID number matches exactly. 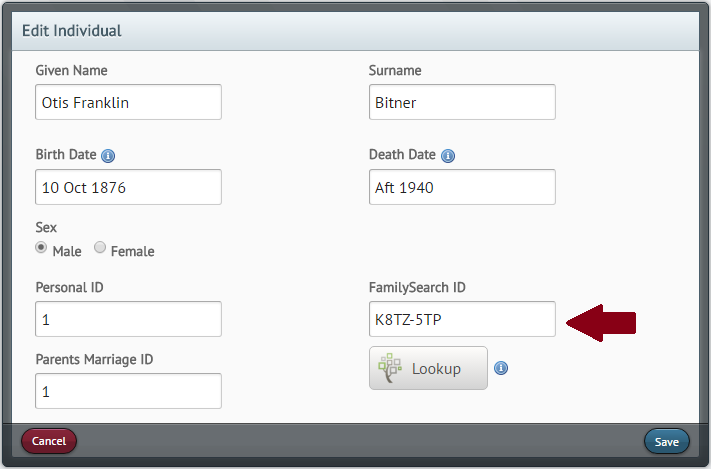 When adding a new individual, if you are entering ID numbers with labels (PID: K8TZ-5TP), or numbers that are not current FamilySearch ID numbers (e.g. AFN numbers, Ahnentafel numbers, personally created numbers), then ResearchTies will not be able to locate the matching person in Family Tree, and the sharing function will not work. To correct this problem, go to the “Lists” icon in the blue toolbar. 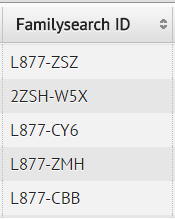 Select the “Individuals” list, and look at the FamilySearch ID column. Every entry in this column should be four alpha-numeric characters, a hyphen, then three more alpha-numeric characters. If anything else is in this field, it needs to be edited so that the sharing function will work. For any incorrect entry, click on the “Edit” action to the right, and edit the number, as needed. You can always use the Lookup function or edit by hand. When finished, click “Save.” Enjoy sharing your research! Announcing a new ResearchTies feature! 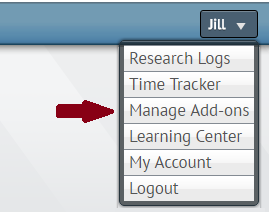 For professionals, students, and anyone who wants more than three ResearchTies logs, it is now possible to add more logs to your account. Additional logs are available in packages of ten. New add-on packages will be prorated according to the time remaining on the current subscription and will renew on an annual basis with the account. Are you ready for the NGS Conference? Come visit with us next week in booth #410 in the vendor hall. In addition to demonstrations, 30-minute hands-on mentoring sessions will be offered at no cost. Bring your questions and come learn more about how ResearchTies will help improve your research. To make an advance appointment for mentoring, send an email to: support@researchties.com. Otherwise, you can sign up at the booth. See you soon! The genealogy research process involves all of the necessary steps to conduct quality research. It is a cycle that helps genealogists focus on finding the desired information, so that more can be learned about their ancestors. Most researchers know the steps, but few think of them in the context of keeping a research log. If you are interested in best practices, keeping a research log is an essential part of the genealogy research process. When beginning a research project, it is important to analyze what is already known. This analysis helps researchers see what they have in their files and decide what information they want to learn. Use the search function in ResearchTies to instantly find anything that is already in your log from previous research. In setting research goals, family historians decide what information they want to find. It is important to record the objective in order to stay focused and not be distracted. ResearchTies begins with recording a research objective. The program also has a checkbox to record whether or not each goal has been met. Next, genealogists look through websites, as well as online and onsite library and archive catalogs to find sources relevant to their objective. Whenever an appropriate source is located, the bibliographic citation needs to be recorded, and the search needs to be defined. Who is the subject of the search? What locality and time period will be searched? In ResearchTies, the user adds “searches” to the objective. These are created by selecting or adding a new source, then defining the scope of the search. When they are saved, the planned searches become “to do” items for future research sessions. When it is time to research, generate a “to do” list so that your work will be efficient. The “to do” list in ResearchTies includes a full bibliographic citation for each source, as well as the call number and the scope or focus of each search. Conduct a thorough search of the record(s). As searches are conducted, it is important to make of copy of what is found. Digital images preserve the documents most accurately. ResearchTies provides fields to record specific citation details for each item found, as well as links to electronic documents and/or URLs. Was the desired information found? If so, mark the objective complete in your log, and move on to Step 2 to set a new research objective. 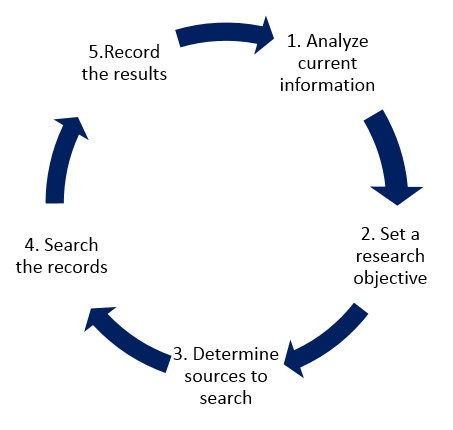 If not, return to Step 3 and locate more sources that might provide what is needed. Recording a quality research log will help any genealogist to be a more efficient and effective researcher. Used well, ResearchTies will prevent duplication of work that has already been done, it will remind you of “to do” items so that they are not forgotten, and it will store all past documents for easy retrieval when needed. Try it today! ResearchTies is happy to announce that we will be participating in the upcoming NGS Conference. Come visit with us in booth #410 in the vendor hall. In addition to demonstrations, 30-minute hands-on mentoring sessions will be offered at no cost. Bring your questions and come learn more about how ResearchTies will help improve your research. Diana Elder of FamilyLocket.com recently wrote a blog post titled, “Research Logs: The Key to Organizing Your Family History.” Check it out!